Burnley's impressive winning streak in the Premier League was brought to an end at Turf Moor as Chelsea stopped the hosts from climbing in to the top six. The Clarets had secured five successive victories in the top flight for the first time in 50 years when beating Leicester City at the weekend but Chelsea controlled proceedings in East Lancashire and prevented their opponents from usurping Arsenal. Mauricio Pochettino tinkered with his side to counter Burnley's physical threat when Spurs won comfortably in December and Antonio Conte's changes were just as effective as Chelsea returned to London with maximum points. While the Italian coach, who had governed the Azzurri before guiding the Blues to the Premier League title, may have had Sunday's FA Cup semi-final against Southampton in mind, there was certainly a purpose to how his side was set up. The most noticeble alteration, ignoring the withdrawal of Eden Hazard and Willian, both named on the bench, was the forward pairing of Oliver Giroud and Alvaro Morata, who combined well as the visitors dominated. It was the Frenchman's improvised flick that sent his Spanish strike partner clear early on but Nick Pope continued to enhance his reputation when sticking out a boot to send the ball wide. And it would have been Giroud's job to guide the ball in to an empty net had Pope and Kevin Long not got their wires crossed when dealing with a Victor Moses cross. The final touch, however, came off the Republic of Ireland centre back as Chelsea took the lead in the 20th minute. Addressing the media prior to the fixture, boss Sean Dyche had claimed that old-fashioned values such as hard work, pride and passion had never been more modern in football. Those traits, a pre-requisite of the Dyche era, were there for all to see but the home side just couldn't get a foothold in the game against opposition boasting such strength and athleticism. Pedro bent a free kick wide of the near post as the away side looked to get their noses further in front while, at the other end, Ashley Barnes was a whisker away from connecting with Matt Lowton's cushioned cross. At times Chelsea's craftmanship could only be applauded; deft touches and intelligent movement which took a couple of players out of the game at a time. That was the case when Morata ghosted behind enemy lines once more but Pope raced off his line quickly to save at the feet of the former Real Madrid frontman. 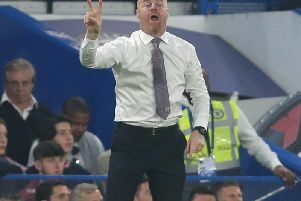 Dyche had claimed that he was lost for words in the dressing room at half-time at Stamford Bridge with the Clarets leading 3-0 against the reigning champions on the opening day. But his team talk at the interval on this occasion must have had an impact as the home side were much improved after the break. Chelsea, though, really should have extended their advantage when Morata raced clear from Lowton's error. The 25-year-old, a £60m signing in the summer, couldn't have asked for a better pass from N'Golo Kante when Lowton's distribution lacked precision but, with only Pope to beat, his attempt kissed the outside of the post. That miss looked like it could prove costly when Barnes restored parity in the 64th minute. Man of the match Johann Berg Gudmundsson's effort was heading inside the near post originally, and it seemed that Thibaut Courtois had it covered, but there was nothing that the Belgian keeper could do when a huge deflection caused the ball to change its course. Chelsea deservedly regained the lead five minutes later when, just after having a shot repelled by Pope, one-time Roma defender Emerson, on his first Premier League start, turned provider. His cross travelled all the way through to an unmarked Moses at the far post and the Nigeria international applied a composed finish, tucking the ball between Pope and the upright. Sam Vokes almost emulated his heroics from the win against Watford at Vicarage Road, having netted after 24 seconds following his introduction from the bench, but on this occasion his first touch from Gudmundsson's corner was comfortably held by Courtois.